Anesthesiologists, who are among the highest-paid physicians, have long fought people in health care who target their specialty to curb costs.Now the doctors are confronting a different kind of foe, writesThe Wall Street Journal (Sept. 26, 2013): machines. 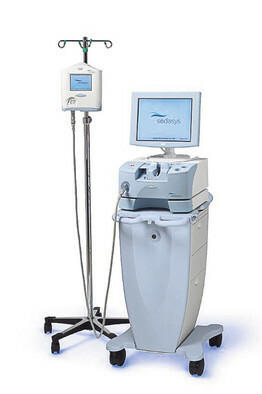 A new system called Sedasys, made by Johnson & Johnson, automates the sedation of many patients undergoing colon-cancer screenings called colonoscopies. That could take anesthesiologists out of the room, eliminating a big source of income for the doctors. More than $1 billion is spent each year sedating patients undergoing otherwise painful colonoscopies. Sedasys “is a great way to improve care and reduce costs,” says J&J’s CEO. Anesthesiologist’s involvement typically adds $600 to $2,000 to the colon-cancer screening procedure’s cost, By contrast, Sedasys would cost about $150 a procedure. As J&J markets Sedasys, many anesthesiologists are sounding the alarm. They say the machine could endanger some patients because it uses a powerful drug known as propofol that could be used improperly. They also worry that if the anesthesiologist isn’t in the room, he might not be able to get to an emergency fast enough to prevent harm. But during testing, none of the 1,700 patients sedated by Sedasys required rescuing. This past May, the FDA approved Sedasys for use on healthy patients 18 years of age and older who require mild or moderate levels of sedation during the colon-cancer screenings. The old textile mills in the Carolinas are mostly gone now. Gaffney Manufacturing, National Textiles, Cherokee — clangorous, dusty, productive engines of the Carolinas fabric trade — fell one by one to the forces of globalization. Just as the Carolinas benefited when manufacturing migrated first from England to New England and then to here, where labor was even cheaper, they suffered in the 1990s when the textile industry mostly left the US. It headed to China, India, Mexico — wherever people would spool, spin and sew for a few dollars or less a day. But remarkably, Parkdale Mills, the country’s largest buyer of raw cotton, has reopened and is thriving–another indication of the resurgence of US manufacturing, reports The New York Times (Sept. 20, 2013) in its cover story. For example, just last year, clothing maker American Giant was buying fabric from a factory in India. Now, it is cheaper to shop in the US, using Parkdale yarn. American manufacturing has several advantages over outsourcing. Transportation costs are a fraction of what they are overseas. Turnaround time is quicker. Most striking, labor costs aren’t that much higher than overseas because the factories that survived the outsourcing wave have turned to automation and are employing far fewer workers. Further, monitoring worker safety in places like Bangladesh, has become a huge challenge. In 2012, textile exports were $22.7 billion, up 37% from just 3 years earlier. That the industry is thriving again is indicative of a broader reassessment by companies about manufacturing in the US. A recent M.I.T. survey found that 1/3 of American companies with manufacturing overseas said they were considering backsourcing some production, while 15% said they had already decided to do so. This means jobs–but on nowhere near the scale there was before, because machines have replaced humans at almost every point in the production process. 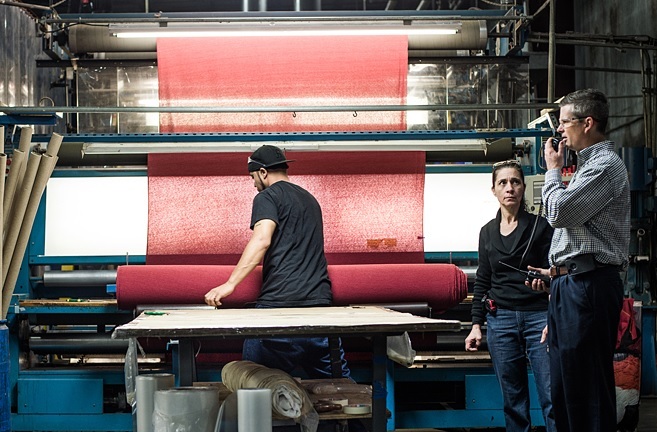 Take Parkdale: The mill produces 2.5 million pounds of yarn a week with about 140 workers. In 1980, that production level would have required more than 2,000 people. In 1950, he set out on a 3-month tour to survey Ford’s plant in Detroit, then the largest and most efficient factory in the world. That year, Toyota had produced just 2,685 automobiles, compared with the 7,000 vehicles the Ford plant was rolling out in a single day. Mr. Toyoda was unfazed, bringing back a thick booklet that outlined some of Ford’s quality-control methods; the company translated it into Japanese, changing “Ford” to “Toyota” in all references. 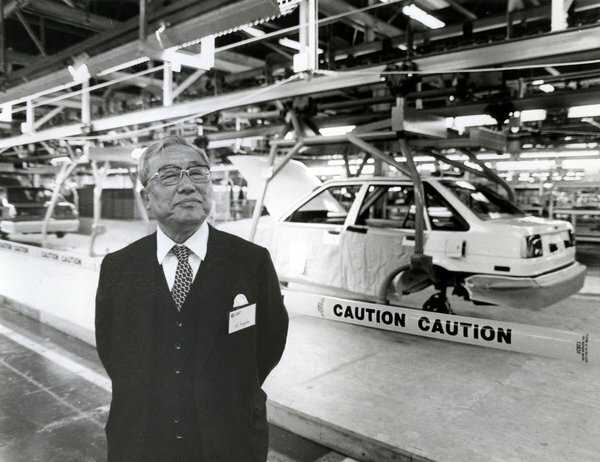 The methods Mr. Toyoda nurtured have had global influence, and Toyoda pushed expansion overseas, establishing the company’s joint factory with GM, called NUMMI. There he introduced his lean-production methods as part of a migration of Japanese auto manufacturing the US. 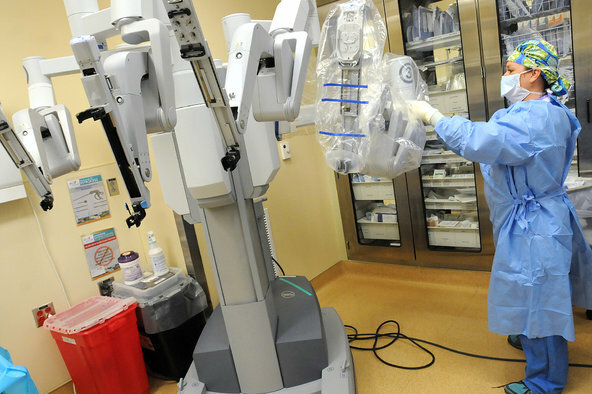 Robotic surgery has grown dramatically, increasing more than 400% in the US between 2007 and 2011, reports The New York Times(Sept. 10, 2013). About 1,400 da Vinci systems, made by Intuitive Surgical Inc. of Sunnyvale, Calif. and costing $1.5- $2.5 million each, have been purchased by hospitals. On the market for more than a decade, more than a million procedures have been performed with the da Vinci. But a new study follows a series of reports critical of robotically assisted surgery. Documents against Intuitive have outlined the aggressive tactics used to market the equipment and raised questions about the quality of training provided to surgeons, as well as the pressure on doctors and hospitals to use it–even in cases where it is not the physician’s first choice and he or she has little hands-on experience. At Peugeot’s soon-to-close car factory just north of Paris, writes Barron’s Business (Sept.9, 2013), management is grappling with an ambitious year-end production quota: finding jobs for the factory’s nearly 3,000 workers. This was the promise Peugeot made to win government and union approval for closing the largest French auto plant in 2 decades. The job placement effort, costing $749 million, underscores how expensive and time consuming it is to close even a single factory in Western Europe, when it is politically feasible at all. Peugeot joins companies, including GM and Ford, that have begun the process of closing plants in Western Europe, where a glut of excess production capacity has made many factories unprofitable. But even though more shutdowns are necessary to adapt to depressed European sales, tough experiences for all 3 car makers may give others pause. Peugeot has been through a year long wringer, with political obstacles followed by union protests that at times turned violent. In the end, the company agreed to give its workers a package of retraining, job placement and severance benefits that are generous even by French standards. As an example, a dozen auto workers were taking shifts driving a bus in a parking lot to train for future jobs Peugeot has lined up for them at Paris’s transit agency. Peugeot is paying for the $13,000-a-person training. “It is the least they can do,” said one worker. “The alternative to shutting down capacity is being more flexible with capacity,” said Peugeot’s HR chief. Loading an airplane quickly and efficiently isn’t an easy task. “It should be, and could be, but the humans involved can’t seem to get with the program,” writes Wired Magazine (Aug. 28, 2013). Better loading means more time in the air – which is where airlines make their money. The boarding process is far from standard – there are almost as many boarding procedures as there are airlines. This problem has long been pondered by operations managers, without a definitive answer. But there have been a few promising experiments. The most unusual and deceptively simple idea is opening the door at the rear of the plane in addition to the door at the front. Alaska Airlines is trying this. The idea isn’t entirely new–many airlines open the front and rear doors at those airports where there is no jetway, only a staircase leading to the tarmac. 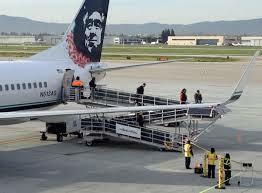 Alaska has a new tool to help facilitate using both doors–a solar-powered ramp. Mounted on wheels, the ramp can be driven to the backdoor of the airplane, and passengers make two switch-back turns down the ramp to the ground, providing an alternative to stairs for easy suitcase rolling and wheelchair access. Using the aft door to unload passengers can reduce the turnaround time by 10 minutes. One of the big reasons boarding has slowed to a crawl is people are carrying more bags aboard to avoid baggage fees. So American Airlines is experimenting with letting those who checked their bag board first. Ideally, these passengers will simply walk to their row and sit down. The airline says that overall it has shaved a few minutes off the boarding process. Although airlines commonly board by sections, it’s generally a free-for-all with regard to where in that section you are. United uses the “outside-in” method of seating window passengers first, then middle, then aisle seats. The airline has been organizing passengers in better defined lines at the gate for each group, with the hope is there will be less of a bottleneck. The exciting topic of 3-D printing continues to evolve, now with a new process called “Selective Deposition Lamination” (SDL). Each 3-D printer builds up objects, layer by layer, but what the layers are made of varies from one to another. Some extrude filaments of molten plastic. Some spray special “inks,” such as liquid polymers that solidify when exposed to ultraviolet light. Some use powdered plastic or powdered metal that is then fixed in place with a laser or an electron beam. For all of these, the process can be expensive, as manufacturers put a high markup on their printing materials, just as the producers of 2-D printers do on their ink. Now, reports The Economist (Aug. 10, 2013) there is yet another way. Office supply company Staples is introducing machine prints that are made of a substance that Staples has in abundance: sheets of paper–at 5% of the cost of the materials for other 3-D systems. In the case of SDL, the process starts by the machine applying drops of adhesive to a sheet of paper. Then the machine slides a second sheet of paper on top of the first and presses them together to bond them. The process continues, layer by layer, until the object is complete. It is then removed from the machine, the supporting material is peeled away, and the finished item, which has a consistency similar to wood, is revealed. Adding color involves old-fashioned 2-D printing. Each sheet, before it is put in the stack, is printed top and bottom with appropriate ink in a pattern that follows the edge of the item at the level this sheet of paper will occupy. Staples hopes people will use their imaginations and print all sorts of other things as the firm expands the service throughout its chain. 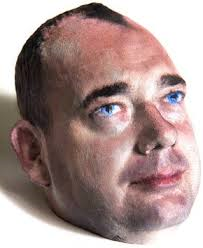 One day, as more office documents migrate to cyberspace, 3D printing with paper may even overtake the 2D sort. (For a lengthy overall look at 3-D printers, see The Economist –Sept. 7, 2013).